Warwickshire’s pre-season preparations started many months ago but one noticeable absentee was the Bears All-Rounder Chris Woakes who had a fantastic 2011 season and is highly rated by the England selector’s to be a future star. The 23 year-old suffered an ankle-ligament injury which would see him out of any action for a long time and maybe a entire season, crucially missing the start of the season. Woakes suffered the injury when he turned a ankle when fielding a ball on tour in Barbados. At first the injury could have potentially needed surgery to fix the problem which would see him out for a season or two but surgery was not required. 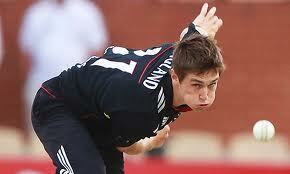 As a result, Woakes is aiming for a return to the first team in May. Meanwhile, the Bears will have to do without their star for the clash between the 2011 county champions (Lancashire) and the 2011 second placed team (Warwickshire) on Thursday in Liverpool. If the Bears are to win the LV=County Championship then they will need their remaining bowlers (Wright and Clarke) to perform in the mean time, just like they did in the Bears 2 wicket win over Somerset.